Believe it or not, there are people marketing this "purely online" SWA Ultimate program in the physical world via flyering, posting stickers at the back of the seats of provincial buses, face-to-face presentations, telephone brigade or telemarketing. Pro: Personal touch. You connect with people who are not comfortable with computers. Con: Higher level of after-sales support is needed because your customers are not comfortable with computers or the internet. Some people add Facebook "friends" left and right, and then fill their Facebook timelines with photos that look like advertisements for SWA Ultimate. Some of them also randomly tag people in FB to notify them about the photo. Con: People will get annoyed by the spam, especially if they are not interested with SWA Ultimate in the first place. You also risk having your Facebook account blocked or even banned. You will publish a blog or website that talks about SWA (in some pages) and more about your useful tips or entertaining stories. Pro: You attract an audience of readers who later turn into fans, some of whom support you in your online business. Plus, even when you stop blogging, your past blog posts will remain online (and will continue marketing your name and your business). Con: Requires time and skills, or the support of a knowledgeable and skilled Team. Allows you to build a relationship with your readers via email. This makes you more visible since people tend to view their Inbox more often than they will visit your blog. Pro: This is another channel you can use to connect with people. Con: Requires copywriting and techinical skills, or the support of an experienced Team. This helps more people connect with you, because they can SEE and HEAR you. In addition, this helps qualify who truly want to work with you. Pro: Connect with people who would rather watch than read. Con: You can lose customers who don't like the way you look or sound. And there you have it! These are the basic earning strategies we have tried in the past (except for the bus seat stickers). 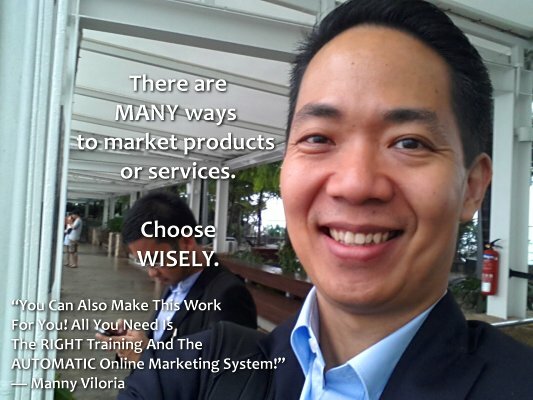 Thank you for reading this blog post... You're invited to Join Team Manny Viloria today!